Refinery / Petrochemical energy systems are large and complex, therefore the auditing and control of energy costs are a real challenge. 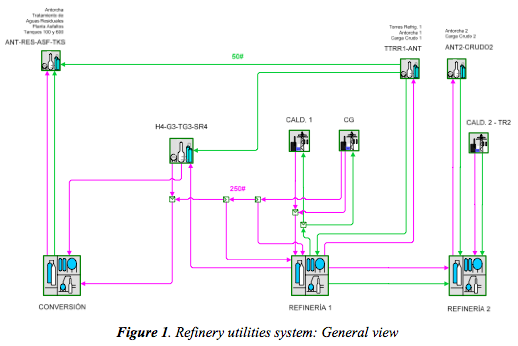 This paper describes the tasks performed to reduce refining / petrochemical energy costs using a modern on line information and optimization system tool. A full model of the refining / petrochemical energy system is built (steam, boiler feed water and electrical system that interacts with the steam system). All the constraints have been included and the model is continually populated with live, validated, real-time data. Performance monitoring indexes are included in the model. Amongst others, they include the follow up of calculated equipment efficiencies using the validated data mentioned before. Fuel system details, including cost and constraints on the carbon dioxide emissions were also included, when requested by the final users. By auditing the energy system, imbalances can be detected and diagnosed. Therefore, the data can be relied on for evaluating the value of energy production and usage, and waste can be eliminated. Planning for a better operation of the energy system by performing case studies is usually done by using the validated model in off line mode. Finally, it is important to mention that the optimization of operating conditions is performed on a continuous, day to day basis. An example of the results obtained during a typical operative day is presented. As a result of the projects, new sensors have been located and substantial savings in global energy costs have been achieved. Our clients operate big and complex refineries / petrochemicals with a combined capacity of several million tons a year. Its energy systems are large and complex, requiring specific tools to help in control and auditing them. Refineries and petrochemical complexes usually operate complex energy systems. They utilize different kind of fuels, operates cogeneration units, have several steam pressure levels, feed different types of consumers and there are emission limits to be observed. These complex energy systems have several degrees of freedom. Manipulating these degrees of freedom with a cost based optimization program usually can result in significant savings in operating costs. This is particularly important within current deregulated electrical markets. Since the electrical system poses one of the main economic trade-offs with a steam system, electrical deregulation provides many new challenges to operate the overall combined system at minimum cost. Furthermore, utilities systems have several constraints coming usually from the operations side. For example, maximum flows and steam production cushions. Finally it is important to mention that, given the complexity of the system, the handling of the utilities optimization is managed at the level of refinery areas. But the individual areas optimization gives not necessarily the true global optimum refinery optimum. In order to successfully address all the items mentioned above, a tool called Visual MESA has been used as the model and optimization engine. Visual MESA is a computer program designed to model steam, Boiler Feed Water (BFW), condensate, fuel, and electrical systems used in more than 30 petrochemical and refining Sites around the world. It is an online program that receives live plant data from the steam, BFW, and electricity plant information system. Visual MESA helps to find the most economical way to run the utilities system, while remaining within the real operating constraints. Visual MESA provides a number of monitoring features that help to access data, control data quality, and alert of changes to the system. Visual MESA allows to perform and evaluate "What If?" cases that enable to find ways to operate more efficiently and at less cost. Visual MESA helps to find where waste steam is occurring in the steam system. In this work, implementation of Visual MESA to audit and control energy costs and the main benefits already obtained are summarized. After a description of the implementation tasks, some results are commented. Finally, conclusions are presented. In the following paragraphs, first the model build and optimization implementation are briefly described. Then, the reports generation and their use for auditing and control of energy costs are explained. A complete model of the overall Energy System was built on each case. The model includes the whole fuel, steam, boiler feed water, condensate and power system. Steam is generated in several different Units, with conventional boilers, heat recovery steam generators and a cogeneration unit with possible steam injection. All the steam pressure levels were modeled and all the units considered with high detail, including all the consumers and suppliers to the respective steam, BFW and condensate headers. Detailed efficiencies curves of the biggest turbines were included in the model and they are adjusted continuously with on line validated data. Electricity and fuels supply contracts details have been included in the model. Figure 1 shows a typical view of Visual Model at the highest Plant level (ref. 1). By navigating through the model, each individual Unit of the system can be monitored in detail. VISUAL MESA has built-in mathematical models and optimization routines to calculate how to run the steam and electrical systems at the minimum overall cost and still meet the required plant steam demands and other plant constraints. The optimization determines where to make incremental steam (which boilers or steam generators) and which turbines or letdown valves will most efficiently let the steam down between pressure levels. Level 1: includes basically the pressure control related devices: boilers, letdown valves and vents are optimized to minimize cost. Level 2: adds the optimization of other continuous variables including turbo generators, steam injection, extraction/induction/condensing turbines, etc. Level 3: adds turbine-motor switching optimization (i.e., discrete variables). Level 4: adds equipment that would create "heartburn" if equipment moves were to be made, such as running a coker-feed pump with a turbine, with a motor standby. Running at level 4 can tell you the cost of your insurance policy. A well running model would generally be run at level 3, with a run at level 4 once in a while to evaluate potential operational changes. Total fuel cost is determined from the fuel use of each boiler and combustion turbine times their respective fuel prices. Total electric cost is determined from the net electric use of each motor, load, and generator times their respective electric prices. The electric generation (power selling) is just negative electric use. 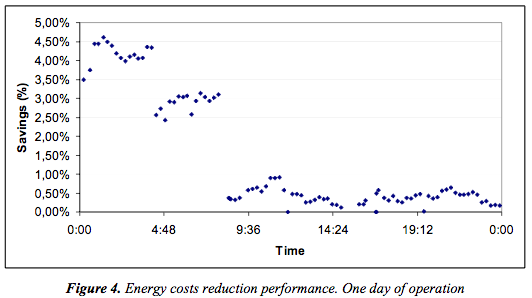 When running on-line, the model considers the electricity price corresponding to the actual hour of the day. Inlet costs are normally used to charge for demineralized water coming into the system, but can be used for any other arbitrary cost. By auditing the energy system, imbalances can be identified and reduced. Therefore, the data can be relied on for evaluating the value of energy production and usage, and wastes can be eliminated. Visual MESA helps to find where wasteful steam use is occurring in the steam system. A Balloon is a Visual MESA component used to measure steam balance closure. A Balloon performs the algebraic summation of all the flows for streams entering and leaving the balance. Since we have a value for the flow of every stream, the total should be 0.0 (all the steam that comes in must go out). If the net balance is not 0.0, there are either meters or estimated equipment flow rates in error, or there is steam leaving or entering the "balance" that has not been accounted. Balloons dynamically show error by changing size and color depending on the amount of steam imbalance. A Balloon is connected to each portion of a steam header where the possibility exists to close a mass balance. Figure 2 shows an example. A closed mass balance is formed by: A group of flow meters, Equipment with associated meters, or a combination of equipment and flow meters. If all of the flows in a "balance" continually add to near zero, the flow data can be relied on for evaluating the value of production and use, and waste can be eliminated. If the balance does not add to near zero, then meters could be bad or equipment steam flow rates could be different than estimated and there might be significant waste. To store model error where the error exists for use when comparing one case to another (i.e., the actual operation against the optimized one). 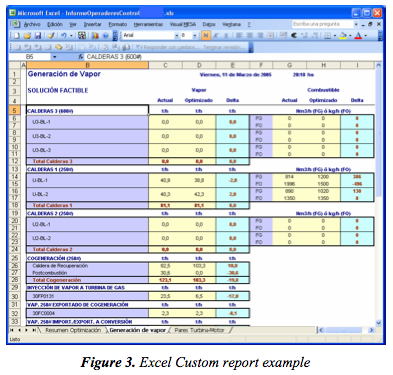 The Excel Custom Report provides a familiar environment for users to view information about the Simulation and Optimization of the system. It also enables users who are not familiar with Visual MESA to take advantage of the information Visual MESA provides. Figure 3 shows an example of report generated with Visual MESA. In the worksheet shown, steam generation and fuel consumption are reported for the current values and the optimized ones. Data comes to Excel directly from the model. As Visual MESA is built around .NET technology, it can communicate seamlessly the Excel spreadsheet to the actual data and optimum operation calculated by the model. As a result, the optimization suggestions can be achieved properly through the existing operating and control procedures. Since VISUAL MESA is an operational oriented tool, the proper training of the operating personnel is a very important project step. The different shifts have been trained by using the refinery model. Feedback from the operators during and after the training classes has been very useful to easier the day-to-day application, improving the report views and the displayed information. In order to facilitate the implementation, at the beginning the optimizer was running at level 2 (only continuous variables) so they can be handled by operators more easily. In a second stage, discrete variables are considered. With respect to lack of sensors, VISUAL MESA utilizes calculated or estimated data in case a sensor does not exist or has a temporary failed state. The most important sensor data are any sensor variable that directly participates in the optimization: Cogeneration (steam flow rate), Boilers (steam flow rate), Letdown valves, Vents, and Motor-Turbine on-off statuses. New sensors have been located to automate the capture of the on-off status from the plant information system. Some important data are sensors that provide data to the model that is not changed by the optimization. Optimization can still be performed and implemented without these Sensors (Reboiler Steam Flows, Temperatures and Pressures). Less important data are any sensor that is only used for monitoring and does not participate in the modeling. In order to illustrate the benefits already obtained, optimization results are shown in Figure 4 (ref. 1). The results correspond to one day of operation by using Visual MESA. Savings are indicated as a percentage of total energy costs. By implementing optimization recommendations the operation is closer to the minimum global energy cost. For example, observe the plot between 9:36 and 14:24hs. When the operator reads the report with 1% of potential savings he considers the recommendations (in this case, a combination of changes in boilers loads and steam flows among complex areas) and the global operating costs are progressively reduced. An important aspect to be highlighted is the fact that the savings are recurrent: they can be sustained along the year representing a substantial energy costs reduction. An on line tool for auditing and energy costs control has been installed at the refineries / petrochemicals. Energy costs reductions have been obtained taking advantage of the VISUAL MESA software functionalities. It demonstrated to be a robust optimizer, well suited to be used on a routine basis by operators. The model is also used to evaluate a priori what-if scenarios that include modifications or different operating alternatives of the Utilities Systems. Auditing and accounting of steam and Boiler Feed Water allows reducing wasting steam and identifying imbalances. Finally, continuous monitoring allows preventing plant upsets and helps to quickly identify steam wastes. It is important to emphasize the high involvement and motivation of plant operators since the beginning of the implementations. Coordination amongst plant areas in order to implement the proposed optimization recommendations is also a critical issue, so management involvement is crucial. The robustness of the tool helped operators to gain confidence on the system. Final user's acceptance and widespread use, for both engineers and operators, is one of the key issues for this successful implementation. "Auditing and Control of Energy Costs in a Large Refinery by Using an On Line Tool", Jorge A. Mamprin, Diego Ruiz Massa, Carlos A. Ruiz, Petróleos de Norte S.A. (Petronor), European Refining Technology Conference (ERTC) Asset Maximisation, Budapest, Hungary, May 2005. "Energy Costs Reduction By Using An On Line Utilities Optimization Tool", Diego Ruiz Massa, Carlos Ruiz García, European Refining Technology Conference (ERTC) Asset Maximisation, Singapore, January 2005. "Energy Costs Reduction By Using An On Line Utilities Optimization Tool", Oscar Santollani, Diego Ruiz Massa, Carlos Ruiz García, European Refining Technology Conference (ERTC) Computing, London, UK, June 2004. "Optimización de Sistemas de Vapor y Potencia en Refinación y Petroquímica", Carlos Ruiz y Sebastián Cúneo, III Encuentro Regional de Ingeniería Química, Asociación de Ingenieros Químicos del Uruguay, Montevideo, Uruguay, Septiembre 2003. "Optimización de Sistemas de Vapor y Potencia en Refinerías Empleando Visual Mesa", David Nelson, Gary Roseme, Oscar Santollani, Sebastián Cúneo and Carlos Ruiz. Congreso Mexicano de Ingenieros Químicos, Instituto Mexicano de Ingenieros Químicos (IMIQ), Cancún, México, July 2002.